HTP is excited to announce a new Phoenix model – the Phoenix Multi-Fit, a stainless steel high efficiency gas fired commercial water heater. This new unit will accommodate even the most difficult installations with lower clearance and multiple inlet and outlet connections – an industry first for Condensing Water Heaters. The Phoenix Multi-Fit is an extremely versatile and efficient appliance suitable for a variety of commercial and residential water heating needs. It provides large quantities of hot water without consuming large amounts of energy. It features a modulating burner that matches energy usage to demand and has up to a 96% thermal efficiency. Combined with whisper quiet operation and low NOx emissions, it is ideal for use in hotels, apartment buildings, restaurants, laundry facilities, schools, homes, and more. 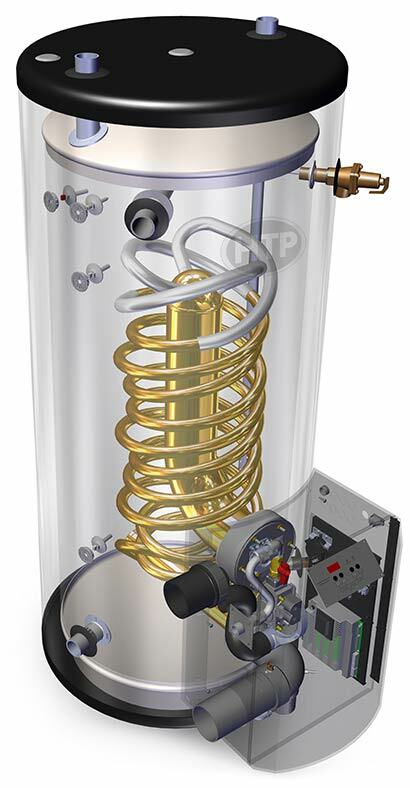 With HTP’s focus on quality design, the Multi-Fit is equipped with a 316L stainless steel tank that resists corrosion and eliminates the need for anode rods. The tank is laser welded and allows for more precise welding through a concentrated heat source. The exterior features faux stainless steel, making it aesthetically pleasing to consumers. HTP’s Multi-Fit also features a unique cupronickel heat exchanger that boasts the best heat exchanger properties in the industry and has an advanced electronic control which makes it easy to program, set system parameters and review fault code history in an easy to read LCD display. The Phoenix Multi-Fit also has a versatile range. It’s available in 80 and 100 gallons and in two BTU sizes (130k and 199K). It vents in inexpensive PVC or CPVC pipe. It’s combined vent lengths of up to 200’ in 3” pipe or 85’ in 2” pipe. The expansion of the Phoenix line adds to the many product offerings found at HTP. For more information on the Phoenix Multi-Fit, check out our website HTProducts.com. The Phoenix Multi-Fit is backed by HTP’s 7 year Residential Limited Warranty or 3 Year Commercial Limited Warranty.